Nonsenseroom have done well to obtain the world premiere of this work by Douglas Maxwell, and as well as these performances at the stunning Rosslyn Chapel they are also taking it for a short run in London. The story focuses on a short period in the life of James II of Scotland as he deals with a potential rebellion, the machinations of his wife and mother, and mental illness. Scott Hoatson produces a wonderfully deep performance as James avoiding the temptation of playing him like a manic Jim Carrey and making him more of a tortured soul. Lois Creasy is excellent as his wife Queen Mary effectively conveying her mixed feelings for her husband, while Charles Donnelly provides perfect comic relief as Bower. 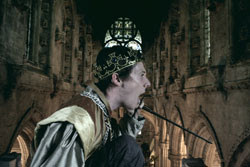 As the King's mother, Queen Joan, Lori McLean was suitably manipulative while keeping the character three dimensional, and Neil Smith brought a believable stage presence to the charismatic Douglas. The tale is tightly plotted with a few twists and turns along the way as alliances switch, and the fact that it's written in verse works well here (and it's something that often irritates me). The scene where James and Douglas swap roles works particularly well and the wide ranging swordfight is impressively staged. It's a pacy and incredibly energetic piece, particularly the second act and as an audience member you'll feel thoroughly involved - both physically and mentally. The humour has a light touch which is well handled by the cast but the core of the play is an emotional one. The Production is top class in its own right, but we'd recommend trying to see one of the 'Gala' performances which include a post-show Q&A and tour of the chapel along with a delicious light buffet and couple of glasses of wine. These performances make it an real experience and the cast/creative team were happy to chat away with the audience during the buffet. "The Ballad of James II" runs until the 25th with Gala Performances on the 18th and 25th. Ticket availability is limited for some dates on the Fringe website but tickets may still be available directly. The show then moves to the Greenwich Theatre, London from 4th to 8th September. And Nonsenseroom have already announced their version of "It's A Wonderful Life" will be returning to Rosslyn Chapel this Christmas. Glad you liked it. Looking forward to it myself. Can you advise me ongetting there by public transport? I think the number 15 bus is only half hourly and finished very early anyway. Any idea how much a taxi from town would cost (and back)? It's always tricky when you've got high expectations - at some point you're going to be disappointed. Fortunately this wasn't one of those times! We're not much use for public transport I'm afraid, as being from Glasgow we usually resort to using http://www.travelinescotland.com. When we know we're going to Roslin we always take the car. Checking up on it Lothian Bus 15 would be your best bet, but the times are dreadful - it would be ok for getting out but not for coming back. There's also First Bus 141 - but it stops early too. A taxi would about £15 each way. Best taxi firm for Roslin would be Penicuik Taxis - 01968 679 600. The 'normal' shows finish at 10p.m., and the gala nights go on till about 11p.m. Looking forward to reading your Edinburgh thoughts. Thanks very much for the information, but I have to say: oh dear! I think that £15 each way is without my budgetary means, and the bus is most certainly impossible for the return journey. Such as shame, but I’ll probably have to write off my ticket for next Monday. I may be able to see it at Greenwich, but I really wanted to see the church as well. I noticed that Phaedra, also taking place at an out of town location, is laying on a bus from C Central for ticket holders, very sensible, and annoying that the producers don’t do that for James II. I’ve never meet anyone at the Edinburgh Festival, apart from locals, who have their cars with them. In 2007 producing a show at a venue inaccessible by public transport is silly (a bit like the Watermill Theatre, but it’s more like £6 each way by taxi from the station during the daytime), I suppose I only have myself to blame for not checking it out earlier! If anyone is going this coming Monday and can either give me a lift (I’ll pay petrol) from town, or is willing to share a cab, please let me know! You can walk to the main raod from roslin it's only a mile and from the big roundabout there are buses coming from Penicuik that run back into edinburgh.